Growing up in a small Pennsylvania town 15 minutes from the Ohio border had its good points and bad points. Good points: a safe place where you could build forts in the woods and ride bikes with your friends all day long; living a short walk away from the school and park; great Italian-American food, Indian food, and Middle-Eastern food. Bad points: I was Asian. Not the only Asian, mind you — I was the Asian Girl. My friend KK who was also in my grade was the Asian Boy. Classmates would come up to me (and probably him) from time to time to ask “Why don’t you go out with KK? It would be SOOO perfect” like the world had rained for 40 days and nights and they were in charge of building some sort of Noah’s Ark with Asian people. This sounds small, but it wasn’t. I was never a viable person that anyone in their right mind would ever consider going out with (and by “going out”, as this was 7th grade, I mean asking your mom to drive you to the Christmas dance in the junior high cafeteria while I wear a Talbots dress borrowed from my mom). I would never get to wear my “boyfriend’s” football jersey on Fridays before the game. I would never get to go to high school parties on the weekends. (I did, however, get to watch a lot of foreign films over sleepovers and play a lot of Dungeons & Dragons, things that have actually helped me a bit later on in life). I used to be sad that I wasn’t an Erin or an Amy or, best of all, a Jennifer. Instead, I was a Chawadee (aka Dog Chow aka Chow Time aka Choo Choo aka Chewbacca). But later, as I grew older, friends would tell me I was “pretty in my own way”. That could be bad, like “you are pretty in a way that no one recognizes”, but it could also be good, like “you are uniquely you”. Looking back, I choose to read it in the good way. I am me. Guay jab — that Thai-Chinese street food dish featuring curled-up flat rice noodles, random bits of pork and either a thick soy sauce gravy (nam khon) or clear soup (nam sai) — might be considered “pretty in its own way”. It’s the least glamorous of all the noodle soups: the silky, savory voluptuousness of a bamee (egg noodles), the easy-to-eat immediacy of a guay thiew moo (pork noodles), the eager-to-please popularity of a guay thiew tom yum (noodles in spicy lemongrass broth). 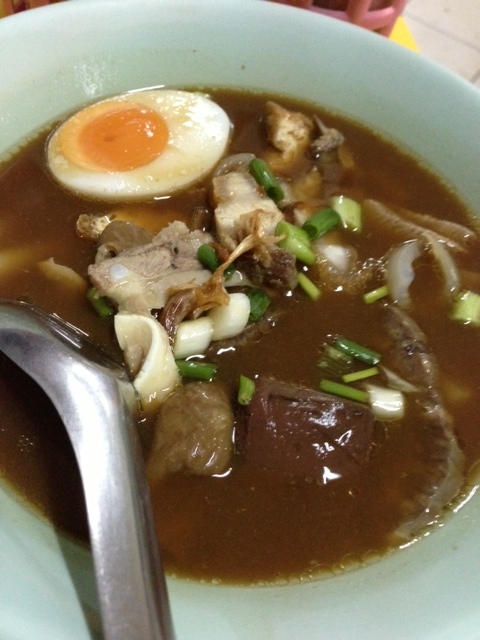 By comparison, guay jab is too challenging, too hefty, too porky — bits of lung, intestine and pig skin mingling with tenderly poached slivers of meat, noodles and, in the case of the thick broth, half a boiled egg. There is no mitigating flourish of lettuce, no handful of palate-cleansing greens. It’s Piggy with a capital P. What are you gonna do about it? There are people who see guay jab for what it is — a celebration of the pig — and like it in their own ways. For the thick-bodied version, look no further than the stand on Sukhumvit Soi 38, the first stall on the left as you enter. Those who like it more in the Chinese style should go to Yaowaraj Road, where the clear, peppery version awaits at Guay Jab Oun Pochana. Either way you like it, you can’t go wrong. Noah’s Ark for Asian People – ha ha… funny! Everybody is somebody’s weirdo 🙂 – but never you, dear Glutton! Haha. I suspect I am many people’s weirdo, but I appreciate the vote of confidence! Such narrow minds in PA – I know it pretty well, as I’m from the other side (Philly). One really positive thing I have to say about that place is the food – I do so miss the hoagies! I could never return there to live, and I suspect the same goes for the Glutton? I’m off for Bangkok next week – please turn down the heat for me. In their defense, it was many many years ago; I doubt an Asian girl would have the same issues nowadays. However, we on the west side do not have the benefit of awesome hoagies. I hope you have an awesome time in Thailand — and the heat is sure to be turned down in the next few weeks! Wow….of all the things that resonate, this RESONATES…for obvious reasons. Also, to draw a connection between guay jab and being the one asexual Asian kid at school throwing six-sided dice in the basement with weirdos takes a lot of talent! Great read! I’m jealous I never played D&D growing up. I shudder to think of the guys who’d invite me to play today. Poignant and porkish read, Chow! They’re not all weirdos. Some are closet fantasy freaks, or have switched to stuff like GOT.